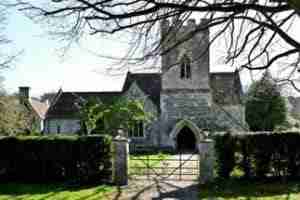 The Church of the Blessed Mary serves the villages of Boyton and Corton, which are a mile apart. It is a beautiful building, the history of which is described below. The villagers are proud of the building and enjoy getting together to clean and decorate the church and maintain the grounds. Currently there are two services a month in the church which have regular, but small, congregations. 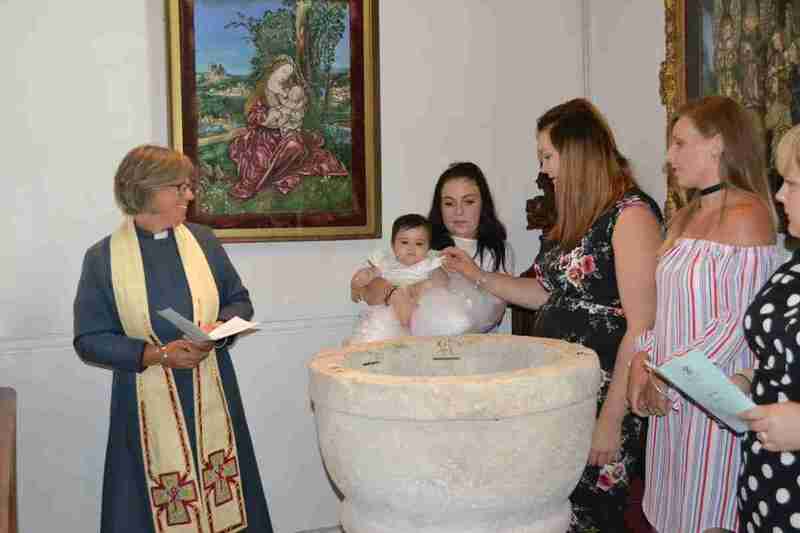 It is on special occasions that the church really comes alive and at Christmas, Easter, Harvest and other festivals the church becomes the focus for village celebrations and the congregations can fill the church. Boyton Church has a reputation for good hospitality on these occasions! 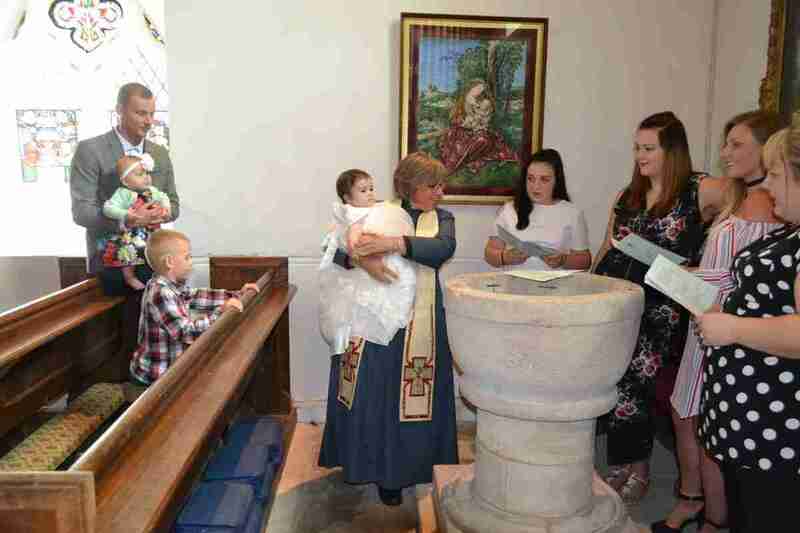 There is a church fete on alternate years, which raises money for the Church and for village facilities. There are no regular midweek activities in the church so members of the church join with other churches for these. The graveyard around the church was closed in the 19th century, there is a consecrated burial ground with a war memorial in Corton. The church can hold up to 180 people, with extra chairs, and is ideal for weddings. The Church of the Blessed Mary at Boyton is one of the most outstanding churches in the whole of the Salisbury Diocese, famous for its remarkable late 13th Century Giffard chantry chapel. 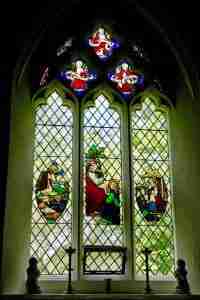 It also contains an internationally important mixture of stained and coloured glass dating from the 13th to the 19th Century. 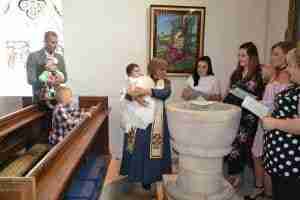 The existence of the church is due to the Giffard family who came to England with the Norman invasion. They were succeeded by the Lamberts, who built Boyton Manor between 1612 and 1618, and followed by the Fanes and now the De Bryes. The earliest part of the church dates from about 1159, but there has been considerable change since then including two periods of serious neglect, requiring extensive restoration. 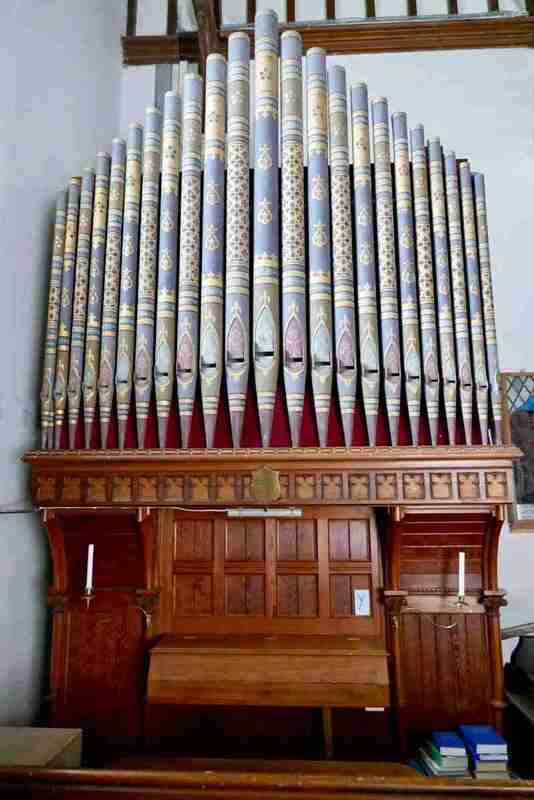 One of the most striking features is the organ, which was given to the church by Prince Leopold, son of Queen Victoria, with its embroidery on the eastern side of St George and the Dragon. The pew ends were originally carved panels of 15th-17th century date, collected in the 19th Century, probably from the Continent. The large stone font, which is still used for baptisms today, dates from about 1100. 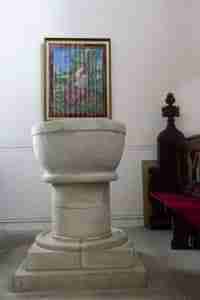 It was removed and hidden prior to the Reformation and buried under a cottage floor. 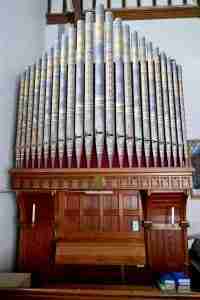 It was returned to the church in 1860. Among the embroideries in the Nave are depictions of the Virgin and Child, Angels with Jesus as a baby and the “Old Testament Trinity” or the visit of the Three Angels of Abraham to tell him that despite her age his wife, Sarah, would have a son, Isaac. The chancel is the oldest part of the church (1170-1200) and is large, unusually so for a parish church. It may even have been the church for a time as the arch separating the Nave from the Chancel is nearly a hundred years later than the date of the chancel itself, and was probably built about 1315. It contains memorials to Dr Richardson, the Rector from 1952-67, and his wife with coats of arms. He was responsible for the major restoration in the 1960s. She, besides being the first Woman Professor at Birmingham University, was the great grand-daughter of Louis, King of Holland, Napoleon’s brother. The Funeral Hatchment is that of HRH Prince Leopold, Duke of Albany, who was the eighth child and youngest son of Queen Victoria and Prince Albert, who was the tenant of Boyton Manor for a period before his marriage. The Altar Table is oak made in 1860 for that restoration of the church. The beautiful gilded wooden altar set, cross and candlesticks, and two standard candlesticks are Italian and are put out for services. 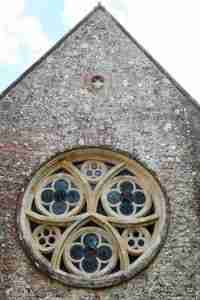 The East Window contains a series of panels made up of largely English medieval glass. 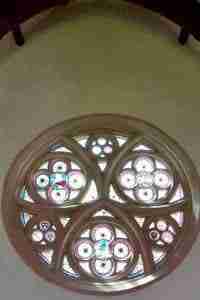 Much of this glass was removed from Salisbury Cathedral and thrown away in 1789/90. It was found, after a seven year search, in 1935 and made up into panels. Salisbury Cathedral rejected these but Winchester Cathedral welcomed them and most are there, but those that were left over are at Laverstock and here at Boyton. 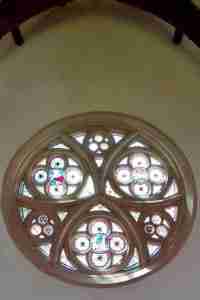 The bottom left hand panel, however, is composed of glass found under the floor of the Giffard Chapel and original to the church. The centre lancet includes “St Catherine and the Philosophers” and dates from about 1500 and below this is the head of Christ but the hands are of a different scale and demonstrate that the panel is made of fragments from different sources. 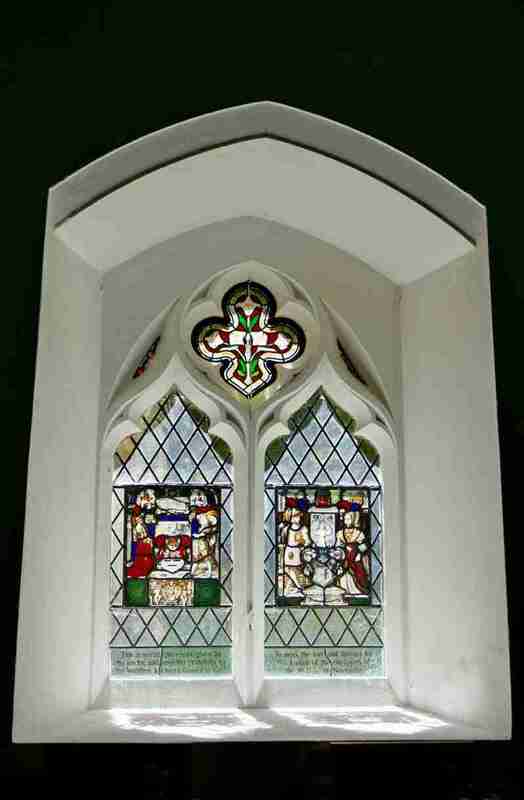 The two lancet windows either side of the altar in the Sanctuary are dedicated to the memory of the Reverend Samuel Routh, rector of Boyton 1816-1822. The images in the window on the right are of ‘soldiers playing dice for the robe of Jesus’ (could Routh have been a gambler?) and a ‘chalice representing the blood of Christ’. The images in the window on the left represent ‘Jesus as the Lamb of God’ and the ‘sacrifice of Jesus on the cross giving his blood for others’ (according to legend, at a time of famine a pelican would draw blood from her own chest to give to her chicks). 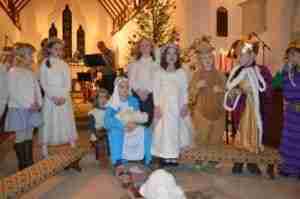 The Christmas Carol Service traditionally involves as many children as possible and is followed by mulled wine and canapés for all. 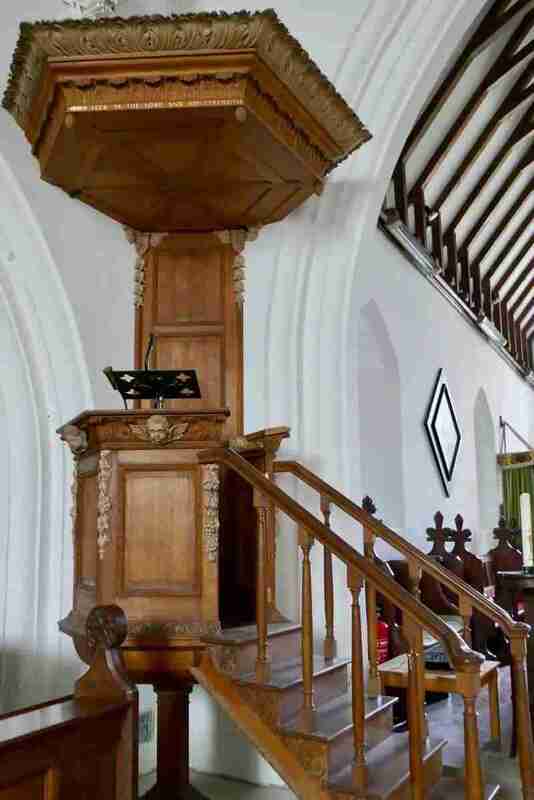 One of the many features that make this church so unusual is that it was built with two Chantry Chapels; one of them is now the vestry but was used in the past for farmworkers. The building of the Giffard Chapel, which is used every month for an early Communion Service, was probably started about 1270. It is dominated by the table top, or chest tomb, which is empty but is thought to have been built to hold the body of Margaret Giffard, who died in 1338. 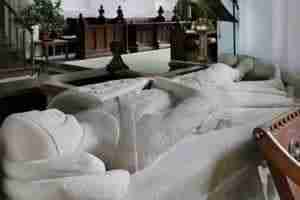 The most striking feature of the chapel is the effigy of the knight in armour lying between the chapel and the nave. The figure represented is probably Sir Alexander Giffard, who took part in the Seventh Crusade to Egypt and who died sometime after 1262. No one is sure why he has an otter at his feet. 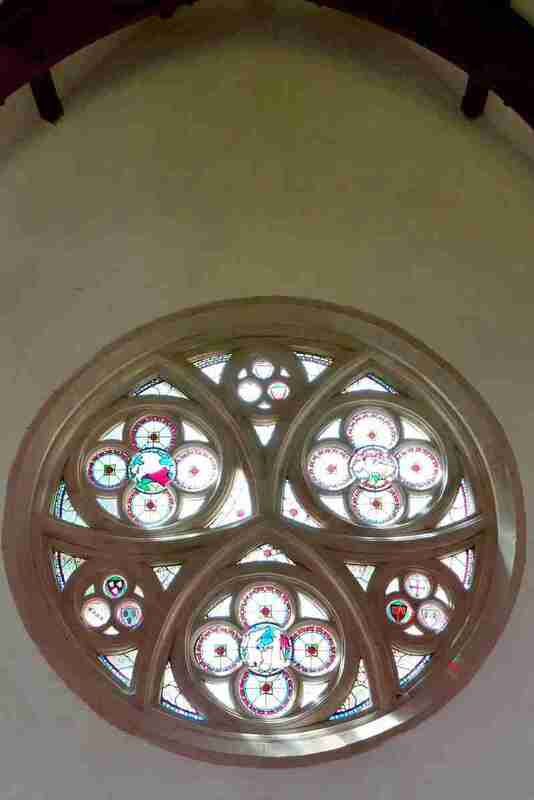 The east window of the Chapel contains more of the historic glass, this time all Continental, installed in the 1960s. The left hand lancet includes ‘Adam delving while Eve spins’, a 17th Century panel that may be of St James, the Pilgrim, due to the scallop shell motif on his hat, and the ‘Triumph of Chastity over Love’; the centre lancet includes ‘The Virgin and Child’ in which Jesus is shown with bare buttocks, which is highly unusual, and ‘St John, The Evangelist, on Patmos’; the right hand lancet includes ‘Tobias and the Fish’ and the ‘Triumph of Fame over Death’. The chapel also contains an early 14th Century stone sculpture, which was originally a roof boss, of St. Martin on horseback dividing his cloak with a beggar. 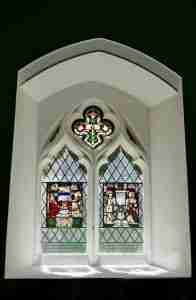 Two of the lancet windows in the Chapel depict scenes in the life of the Virgin Mary to whom the church is dedicated. One portrays “The Annunciation to the Virgin”; the angel Gabriel announcing to Mary that she would conceive and become the mother of Jesus, the Son of God. It is rare to find such panels in a parish church. 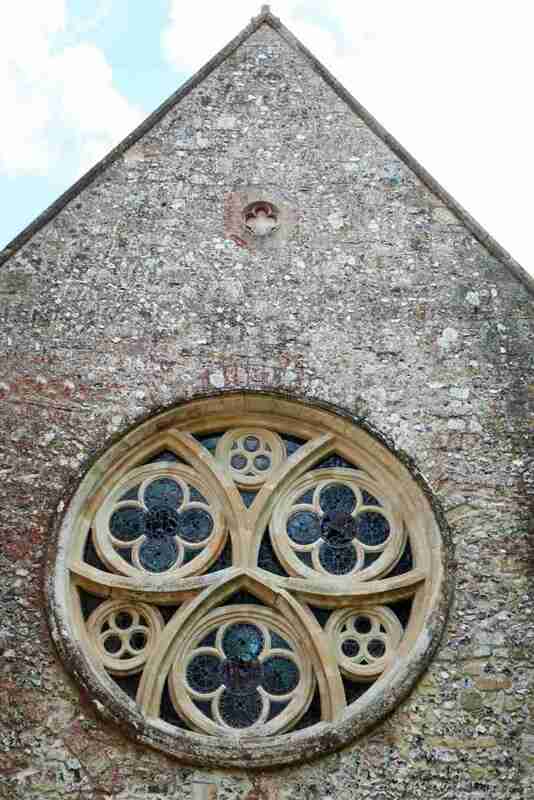 The enormous round window on the western wall of the chapel has for years been described as a wheel window but it has no straight spokes so some experts dispute the description of it being a wheel window. 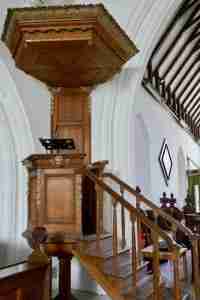 It is twelve feet in diameter, it dates from 1270-1300 and is believed to be unique in a parish church. Sadly the original glass was lost when the church fell into disrepair in the 19th Century and so the current glass is Victorian.